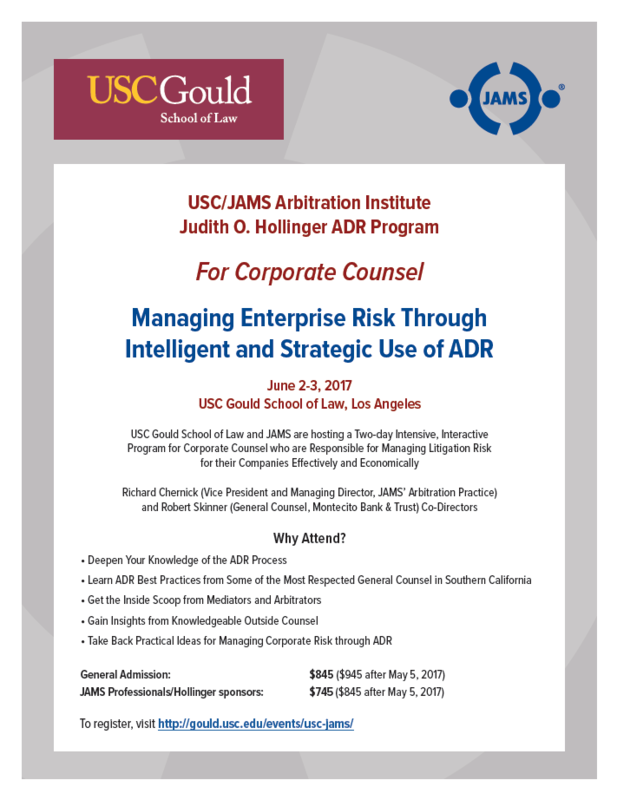 USC Gould and JAMS are pleased to invite you to a two-day intensive, interactive program for Corporate Counsel who are responsible for managing (mostly) litigation risk for their companies effectively and economically. Participants and attendees will include ADR practitioners, ADR panel administrators and managers, litigators, judges and members of the academic community. JAMS, a State Bar of California-approved MCLE Provider, certifies that this actively qualifies for Minimum Continuing Legal Education Credit in the amount of 10.5 total hours (no ethics). What you need to know about non-binding and binding processes. Understanding legal and process issues. Zela “Zee” G. Claiborne, Esq. Topics include: establishing the arbitration, managing the process, managing the hearing, the award and correction, and court review.